Vincent Abdella Obituary - Shrewsbury, Massachusetts | Britton Funeral Homes, Inc.
Vincent F. Abdella, 91, of North Grafton passed away peacefully surrounded by his loving family on Thursday, July 5, 2018 at UMass Memorial Medical Center in Worcester. Born, raised and educated in Worcester, Vincent was the son of the late Joseph and Mary (Slyman) Abdella. He was pre-deceased by his seven brothers and sisters. 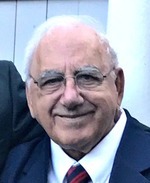 Mr. Abdella is survived by his three children, Lynne Hammond and her husband Philip of Boston, Frances Sheehan and her husband Kevin of Woburn, and Michael Abdella and his wife Patricia (Manzi) of Worcester, five grandchildren, five great grandchildren, and long-time companion Terri Dion. Shortly after graduating from the Worcester Boys Trade School, Vincent enlisted in the US Coast Guard in 1944 serving on the USS Wakefield, a troop and transport ship. Following his honorable discharge from the US Coast Guard, he began his own trucking company, V. F. Abdella Trucking and was involved with major roadway construction projects throughout the Commonwealth. He was an avid golfer who enjoyed working at golf courses in both Massachusetts and Florida for many years, most recently with his long-standing golf group at Highfields Golf and Country Club in Grafton. Relatives and friends are invited to attend visiting hours on Sunday, July 8 from 4:00 to 7:00 PM in the BRITTON-SHREWSBURY FUNERAL HOME, 648 Main Street, Shrewsbury, MA. His funeral will be on Monday, July 9 with a Mass of Christian Burial at 10:00 AM in St Mary’s Church, 640 Main Street, Shrewsbury. Burial will be in Mountain View Cemetery in Shrewsbury. In lieu of flowers donations may be made in his memory to the St. Jude Children’s Research Hospital, 501 St. Jude Place, Memphis, TN 38105.